As I featured here on Friday, the Florida State Seminoles are in Omaha at the College World Series. 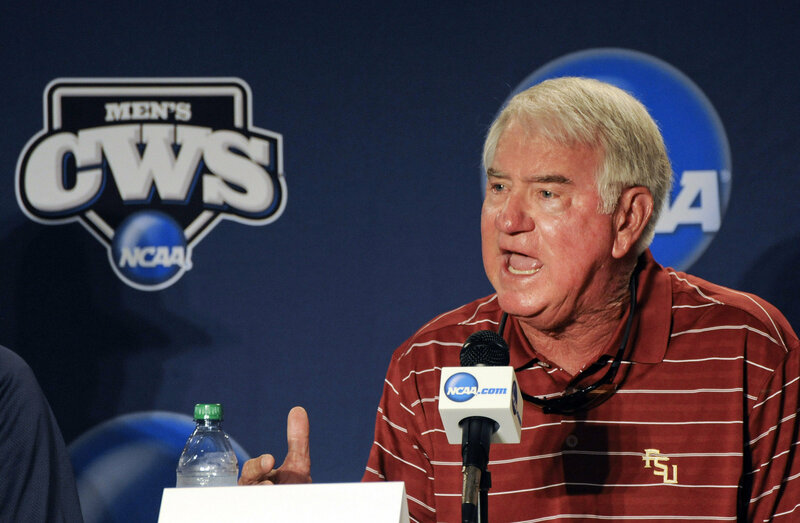 The first weekend of college baseball’s final tournament is in the books and the good thing is that the Noles are still alive, barely, but alive. After dropping their first game of the CWS on Friday night 4-3 in 12 innings against a tough Arizona Wildcats squad, the Noles bounced back to eliminate the Stony Brook Seawolves last night and live to see another day and another game and will face UCLA tomorrow night at 8 PM in another elimination game. Nothing is ever easy once you get to Omaha, and Friday night’s game was the epitome of College World Series Baseball. The Seminoles found themselves in an early 3-0 hole as true freshman starter Brandon Leibrandt exited after just 4 1/3 innings after allowing 3 runs, 6 hits and striking out 5 batters, but as is the case with any baseball game, but college baseball especially, you can never count a team out until the game is final. Arizona starting pitcher Kurt Heyer was pretty dominant early on in the game, but in the sixth inning John Holland had a huge two out, two-run double that tied the game at 3-3, scoring Jayce Boyd and Josh Delph in evening the score. After the game Holland said of the double, “he just left the pitch over the plate that I was able to get a barrel on. It felt good. I thought it was a good boost and energy level that we had in the dugout to try to keep putting in on them”. Unfortunately those runs would be the last that the Noles scored in that ballgame, one that went into extra innings and had tense moments from start to finish. The Noles did have plenty of chances to win but were not able to capitalize, most notably when shortstop Justin Gonzalez was picked off of first base during the extra frames. Gonzalez also had two tough errors in the field on Friday night in what was a nightmare game for him, but thankfully he got his redemption last night. Going 0-2 and BBQ is the worst case scenario for the teams lucky enough to make it to the College World Series and the Noles came out like they had something to prove, especially Justin Gonzalez. It didn’t take long for the Seminoles to prove that they were the better team in this game as they put up a crooked number in the third inning to secure a strong lead early and never looked back. In scoring 7 runs in the 3rd frame, including a three run home run blast by Gonzalez, the entire FSU ball-club exploded with emotion and proved to themselves and to all college baseball fans that they belong in the situation that presents itself now. 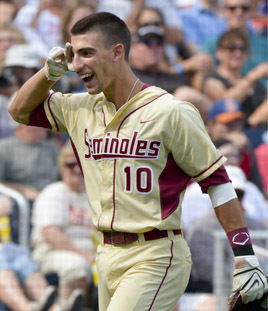 In the next inning Devon Travis connected for another home run, and the Noles cruised to the easy victory in eliminating the Seawolves to send them back to Long Island, New York as the first team eliminated in this year’s College World Series. After the game Gonzalez said “that Friday game was a test of my faith I feel like….to be able to bounce back like that, it wasn’t me out there. It was kind of a revelation that God gives us this platform and he tests us and to be able to come out there and help my club the way I did, just shows that I was blessed today to be able to do that. So as far as the game before, I mean it’s just baseball, man. You’re going to have your ups and downs as long as you stay level.” Gonzalez’ story of redemption is truly inspiring and the Noles will need him to stay strong and continue to play like the excellent player that he’s been for the team all season for this run to continue. The Noles have another tough elimination game tomorrow night against the UCLA Bruins who were knocked out of the winner’s bracket by the same Arizona Wildcats team that beat FSU on Friday night. The Bruins fell 4-0 to Arizona last night as the Wildcats’ Connor Wade threw his first career shut-out limiting the Bruins to just 5 hits, so it should be interesting to see how they bounce back tomorrow night. The Noles will send junior right-handed pitcher Scott Sitz (3-3, 3.99 ERA) to the hill in tomorrow’s elimination game and they will try to improve their record to 16-20 all-time when facing elimination in the College World Series. This entry was posted in FSU, NCAA and tagged Baseball, College World Series, CWS, Florida State, FSU, NCAA, Omaha, Seminoles, Sports. Bookmark the permalink.